Google trends is one of the best and most versatile tools available for any marketer out there. There are literally billions upon billions of searches performed in Google every single day. So why not gather that information and use it at your will? You can use Google trends to discover basic data about your brand, your market share, your competition and seasonal trends. “Google Trends gives you a glimpse into the topics the world is searching for.” The trends begin in the year 2004 and go forward. These trends can be sorted by types of searches (web, image, news, products, or YouTube), geographical areas, time span, and categories, and the tool allows you to compare up to five search terms at a time. There is a variety of ways you can use Google trends to gather the data you want the most. For an example take a look at these screenshot. 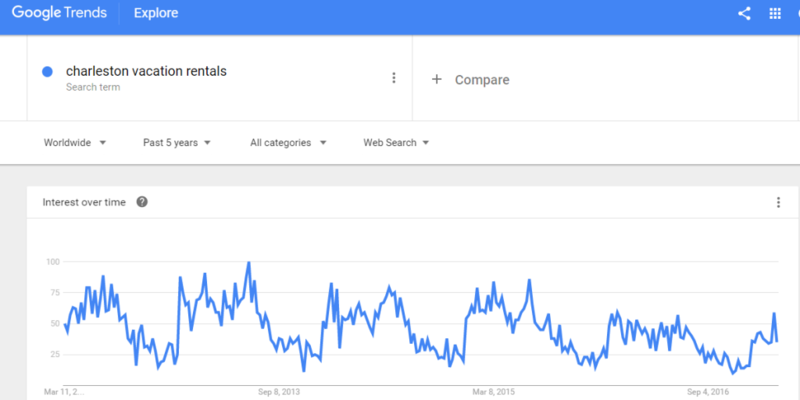 You can see the search term “Charleston vacation rentals” and see the interest over a period of time for that specific search term. 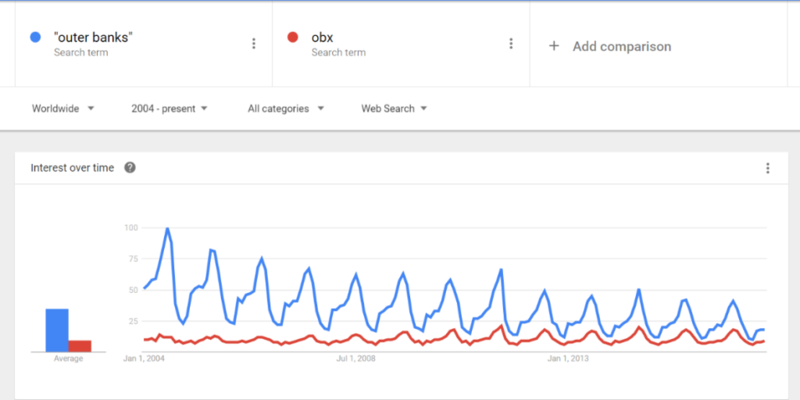 This example shows you the interest over time of the keywords, Outer Banks and OBX. As you can see year over year, there has been less searches performed for Outer Banks. However, you can see people are starting to use the term OBX instead of the full name. They say, keep your friends close, but your enemies closer. The best way to beat your competitors is to understand them. You can learn a lot from your competitors graphs. If they are doing well, you can research the “peaks” and see how it was created. If they are doing poorly, you can research on what to avoid and understand how to adapt your marketing strategy. If you are not monitoring your brand, you should be! When you monitor your brand, you should be looking out for active ways that you can improve your market share and positively increase your brand presence. Google trends can provide you with a detailed report on how you are faring. Just enter your company’s name and it will show you the information of “interest over time” via a graph and data on how searchable your brand on a per year scale. If you need to write content for your blog, or for your website, understanding seasonality is a critical factor. There is no point in publishing content that your audience may not likely to engage with. Google trends can help you find the most relevant topics for the time of year, you need. This will drive your content creation and give you ideas on what your audience is attracted to. Building your brand online can be a daunting but rewarding task. Explore the benefits of Google trends and see how it can get you ahead of your competition. If you do not want to be bothered with all this research and data, let InterCoastal Net Designs do the work for you. We have a full vacation rental marketing and SEO team at your disposal. Give us a call today at 866.249.6095!